As a verified or network admin, you can add, block, or remove Yammer users, and define what fields to include in their profiles. In Office 365, go to Admin > Yammer. Or, in Yammer, click the Yammer settings icon , and then click Network Admin. Users are not part of the Yammer network until they have clicked the Yammer tile from Office 365 or logged in once to Yammer. Only employees with a company email address can be invited from this screen. If you have chosen to enforce Office 365 identity, only users with a Yammer license can join the Yammer network. If you invite a user to a group who is not licensed to use Yammer, that user will be suspended in Yammer and removed from the group member list. They will not receive announcement emails. In the Yammer admin center, go to Users > Invite Users. Enter individual email addresses, and then click Invite. Click Import an address book and import a .CSV file exported from a file email application such as Outlook or Apple Mail. The .CSV file should include one email address on each line. If you want to include other fields such as Job title and Full name, you can use bulk update. For instructions on formatting a .CSV file for bulk update, see Bulk update users by importing a .CSV file. If your organization uses more than one Internet domain for email addresses and you would like to add users from other domains to your network, consider performing a Yammer network consolidation. For more information, go to Network migration: Consolidate multiple Yammer networks. A "pending user" is someone who has been invited to a yammer network but never logged in. Pending users can be added to groups even before they join the Yammer network. Pending users receive announcement notification emails from group admins. If users don't want to receive announcements from a particular group they can log into their Yammer account and leave the group or follow the unsubscribe link in the email to unsubscribe from all Yammer emails. As in all Office products, pending users will be visible in the group member list even if they have never logged in. Invite external contacts with email addresses outside of your domain (e.g., consultants, contractors, or partners). Guest email domains are not added to the list of authorized domains for your network. In the Yammer admin center, go to Users > Invite Guests. Enter individual email addresses. Guest users, including active and pending (those who have not yet responded to their invitation), are listed on this page. As with other users, guest users' names and profiles remain blank until they accept their invitations and complete registration. Guest user accounts can be deleted any time, but their contributions to the network remain. For more information about guests, see External Messaging FAQ. You can deactivate or permanently remove users, including users, including active and pending users and guests. In the Yammer admin center, go to Users > Remove Users. Enter an existing user's name. If the user is not using Azure Active Directory (AAD) credentials, this blocks the user from logging on until they verify their email address again. Without access to their verified email account, they cannot log back on to Yammer. User profile information, messages, and/or file uploads remain. This can be a useful option for contract employees that have completed their project but can be renewed again later. 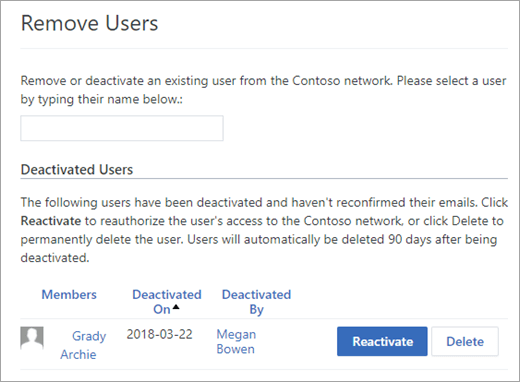 Deactivated users can reactivate their account within 90 days by enabling their email account and logging on to Yammer, where they will receive an email with links to reactivate. After 90 days, the account is permanently deleted. If the user is using AAD credentials, first use this action to deactivate the user and then also follow the instructions in [Block users]https://docs.microsoft.com/yammer/manage-yammer-users/add-block-or-remove-users#block-users. Permanently remove this user and keep messages: This lets you remove the user and retain the messages and content they posted. Permanently remove this user and messages: This lets you remove the user and all the messages they posted. This cannot be reversed. Erase this user. Wipe their name and personal information, but leave their messages. (Can't be undone after 14 days): This deactivates the user for 14 days so the admin can evaluate files and messages before the user is permanently deleted. This option is typically used for executing a GDPR data subject request. Before using this option, read Manage GDPR data subject requests in Yammer Enterprise. For GDPR information for all of Office 365, see Office 365 data subject requests for the GDPR.. The first three deletion options leave the user's name in stored Yammer data. The only way to remove the user's name is to use the Erase this user option. If there are any deactivated users, they are listed on the Remove Users page. You can reactivate or delete a user from this list. In the Yammer admin center, go to Users > Account Activity. Type a user's name. You'll see what devices they are currently logged in, when they last logged in on each device, and which IP address was used. You can also log the user off the device from this list. To monitor activity and device usage for your entire Yammer network, see Office 365 Reports in the Admin Center - Yammer activity report and Office 365 Reports in the Admin Center - Yammer device usage report. Users with blocked email addresses cannot join your Yammer network unless you or another admin unblocks those addresses. Blocked users will still see a Yammer tile in Office 365. In the Yammer admin center, go to Users > Block Users. Enter the email address of the user to block. You can separate multiple email addresses with commas or line breaks. If the user you select is in a suspended state in Yammer, blocking that email address puts the user in a deleted state. Yammer is most effective when every post comes from an individual user. Therefore, you might want to block group email addresses. In the Yammer admin center, go to Users > Block Users and enter the email addresses of the users to block. In the Microsoft 365 admin center, remove the Yammer license for the user. For steps, see Turn off Yammer access for Office 365 users and see Manage Yammer licenses in Office 365. Yammer occasionally sends email updates to users. When an employee's email address is disabled, the emails we send bounce back. In the Yammer admin center, go to Users > Bounced Emails. If the user is no longer an employee, select the user from the list, and click Deactivate. In the Yammer admin center, go to Users > Bulk Update Users. Format your .CSV as a table and include a first line that defines the fields in the following order from left to right: Action, Email address, Full Name, Job Title, Password, and New Email. New If you leave the password field blank, the user is created as "pending". If you specify a password, the user is created as active and immediately shows up in the Member directory. Update The existing Yammer account remains the same. However the other fields (name, title, password, email address) will change to match those in the .CSV. Updates to email addresses can occur only to domains that are part of your Yammer network. Suspend The user account is suspended until the user verifies their status via an email request. Delete The user account is deleted, but the user's messages and attachments remain in the network. Excel does not encode non-English characters in CSV files correctly. If you have such characters in your users' names, you can create a UTF-8 encoded CSV file in Notepad to use for bulk updates. Open the file in Excel, and then choose File > Save As. In the Save as type box, choose Unicode Text (*.txt). Make sure the fields in the file are delimited with commas. Search and replace all tabs with a comma ",". Copy the tab character from your text, and then choose Edit > Replace. In the Find what box. paste the tab character, and in the Replace what box. enter a comma and choose Replace All. In the Encoding box, choose UTF-8. In the File name box, change the file extension to .csv instead of .txt. In the Yammer admin center, go to Users > Export Users. Select whether to export all users, or to export only users added during a specified date range. This provides a .ZIP file containing 3 .CSV files, for admins, users, and networks. User fields include: User ID, Email Address, Name, Job Title, Location and Joined On (the date they joined the network). In the Yammer admin center, go to Users > Profile Fields. Select the options to include. Profile fields are searchable to help users find each other when they look for particular information, background, or expertise. Each user can customize their individual email notification preferences by clicking the three dots in the top navigation bar and going to Edit Profile > Notifications. They can also go to Edit Profile > Preferences to adjust their own message and time zone settings.